Keith Thorpe/Peninsula Daily News Lefties second baseman Trevor Rosenberg, left, tags out Victoria’s Trey Bigford on a steal attempt in the third inning on Thursday night at Port Angeles Civic Field. PORTLAND — The Lefties kept up their winning ways when it counted Friday, canning the Portland Pickles 3-2 in the official West Coast League regular season opener for both teams at Walker Stadium. Just as in their exhibition home opener Thursday where hit batters proved crucial in an 8-7 walkoff win over Victoria, the Lefties didn’t have to get a hit to bring home the winning run in Friday’s contest. With two outs in the top of the sixth, a third strike to Port Angeles designated hitter Stephen Sepcich hit the dirt and caromed off the backstop bringing in Ronnie Rust from third with a feet-first slide for the eventual game-winning run. Rust was hit by a pitch to open the inning and moved to second on a sacrifice bunt. He moved to third on a wild pitch, and after a walk to Cameron Allie and another hit batter (Brady Heid), scored on the botched third strike. Rust previously notched a broken-bat RBI single to open the scoring for the Lefties in the top of the second and Matthew Christian added an RBI single in the third. Port Angeles pitchers led the way in the victory, with four Lefties’ hurlers racking up an impressive 19 strikeouts, led by eight from Kade Mechals in four innings on the mound. 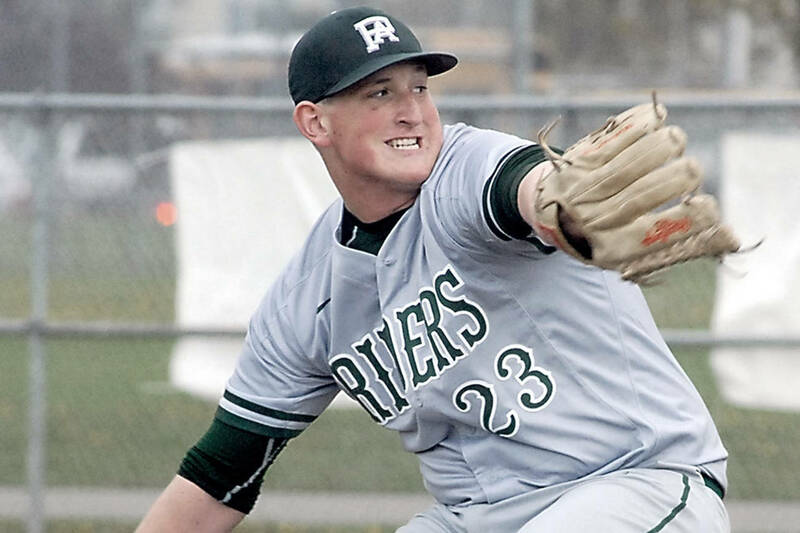 Mechals, a McMinnville, Ore. product, threw a no-hitter for Port Angeles manager Darren Westergard this past spring at Skagit Valley Community College, and has signed to pitch for NCAA Division I Grand Canyon University next season. Also throwing for Port Angeles: Nick Parr, who picked up the win and struck out five of the 10 hitters he faced over two innings; Justin Dolezal who notched four strikeouts in two frames and Baxter Halligan who threw a clean ninth inning with two strikeouts to earn the save. Port Angeles (1-0) played Portland late Saturday and will wrap the three-game set with the Pickles tonight at 5:05 p.m. before heading to Bend for a three-game set with the Elks. Lefties — Mechals 4IP, R, 2H, BB, 8K; Parr 2IP, R, 2H, 2BB, 5K; Dolezal 2IP, H, BB, 4K; Halligan IP, H, 2K. Pickles — Roth 3IP, 2R, 6H, BB, 5K; Lauderdale IP, BB, K; Newstrom 3IP, R, 2H, 3BB, 5K; Copeland 2IP, 2K. Lefties — Harum 2-4, R, BB; Christian 3-5, RBI; Rust 2-3, R, RBI; Sepcich 1-5, R, RBI. Pickles — Berry 2-3, BB, 2B; Diaz 1-3, R, RBI; Dennis-Lee 1-1; Lopez 1-4, RBI. HarbourCats — Brunnig 3IP, R, 4H, BB, 2K; Stevens IP, R, 2BB, K; Stovman IP, 2K; Yoshihara IP, K; Walker IP, 2R, OH, 4BB, 2K; Chung-Ho 1.1IP, 4R, 2H, BB. Lefties — Dotson 2 2/3IP, 6R, 6H, 2BB, 2K; Busse 4 1/3IP, 0R, 3H, 5K; Duwawry IP, R, H, BB, K; Oldenburg IP, 2BB. HarbourCats — Pecota 1-3, RBI; Bigford 1-1, 2RBI; Smith 1-4, 2B, RBI; Green 1-1, RBI; Jet Fagg 1-3, 2R; Nantes 1-1, RBI. Lefties — Allie 1-2, 2RBI; Harum 1-4, R, BB, 2B; Christianson 1-5, 2R; Rust 0-2, BB, R, RBI; Risenburg 1-2, 2BB, 3R, 2RBI.